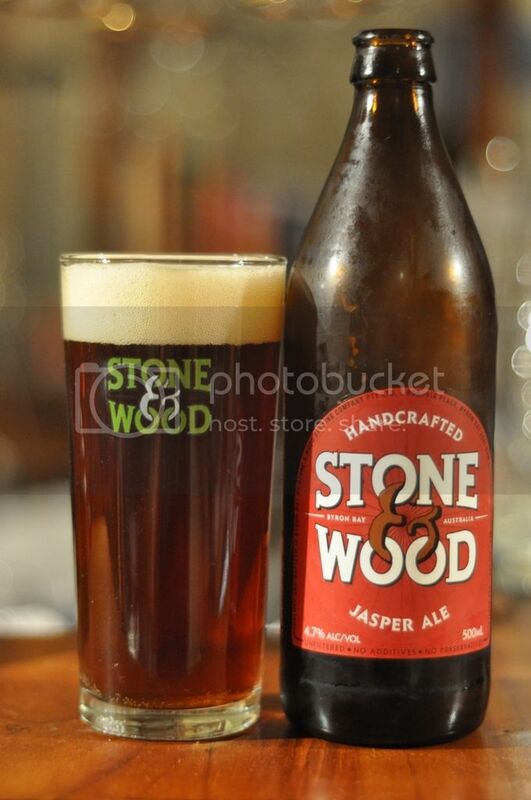 The Jasper Ale is the newest addition to the Stone & Wood range. With their range also including Australia's best beer, the Pacific Ale (see review here), alot has been expected of this new arrival. I bought this one last week and have been looking for an appropriately cold day ever since. A bit of research into this beer has made it hard to classify into a particular style. From speaking to a few people they think it's got alot of Altbier qualities to it as well as having distinct American Amber Ale characteristics. The Stone & Wood website says that it is also based upon the English Brown ale styles. All of these things lead me to one conclusion, this will be one delicious beer! The Jasper Ale has an orange amber colour when poured with a reasonably small orange tinted head. The bubbles in the head are nice and tight and it has quite good retention. There doesn't appear to be a heap of caronation, but it doesn't a ring of head lasting all the way until the last drop. It's a really nice looking amber ale. For an amber ale there is only a mild aroma. What little nose there is is quite grainy, a caramel touch gives it a sweetish tinge before some grassy hops balance it out. It's a little light on in terms of hops on the nose, I'm hoping there is a little more hopping when it comes to tasting this beer. On the whole though there is not alot of a nose here, and for an amber ale this is not necessarily a bad thing. Upon tasting this beer I was instantly impressed. The Jasper ale to me tastes very similar to a traditional altbier. The beer has a slightly sweet palate to begin with, which has some nice fruity flavours and a nutty finish. There are some relatively weak hops, which provide some bitterness but barely enough to balance the beer. The body of this beer is quite thick considering the low ABV, it's a really nice winter ale. Stone & Wood have produced another ripper of a beer here! I know the review above comes off slightly more negative than that statement, but honestly the beer is really good. The carbonation is quite low, almost in the style of an English ale, which makes this beer very drinkable. I'm definitely going to buy this beer again, it's a very worthy addition to the Stone & Wood range.